Changing Lives, the lead partner of the Fulfilling Lives programme in Newcastle and Gateshead, has been awarded Charity of the Year at the North East Charity Awards 2017. Changing Lives was awarded the prestigious title at the North East Charity Awards, which were held at the Boiler Shop in Newcastle-upon-Tyne on 28th September 2017. Changing Lives were one of three charities based in the North East shortlisted for this category, alongside FACT (Fighting All Cancers Together) and Harbour Support Services. Last year, Changing Lives also made the shortlist, but lost out on the top award to Children North East. 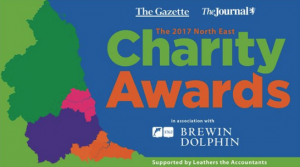 The annual awards are organised by The Journal, The Gazette and VONNE, with associate sponsors Brewin Dolphin and support sponsor Leathers LLP, to celebrate the achievements of the region’s charity, voluntary and social enterprise sectors in the region. Changing Lives is the lead partner of Fulfilling Lives Newcastle Gateshead, working in a core partnership to deliver the programme with Oasis Aquila Housing and Mental Health Concern.